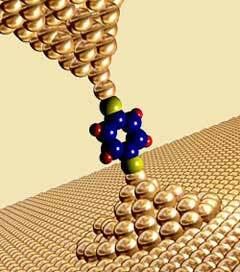 (Nanowerk News) US researchers have successfully demonstrated the thermoelectric effect in an organic molecule. Until now, thermoelectricity - the generation of electricity directly from heat - has largely been confined to systems consisting of metals or inorganic semiconductors. The findings open up the possibility of potential new energy sources, and also present a novel way for probing the electronic structure of molecular junctions, something that is crucial for the development of the field of molecular electronics. 'The effect may seem quite small now, but this is a significant proof of concept and the first step in organic molecular thermoelectricity,' said Pramod Reddy, one of the research team. This view was echoed by Majumdar: 'The use of inexpensive organic molecules and metal nanoparticles offers the promise of low-cost, plastic-like power generators and refrigerators,' he said.